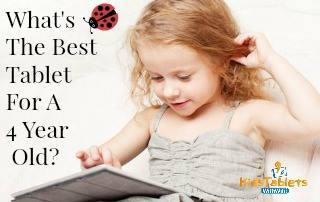 If you’ve looked around the site very much, then you already know that I recommend the Kindle Fire for Kids quite often. This is because it offers a tremendous value when compared to a lot of the other tablets designed for children that are currently on the market. 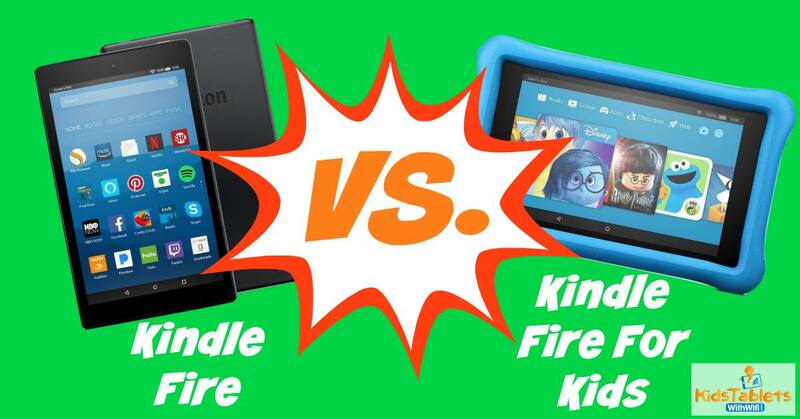 However, many people have asked me what the differences are between a regular Kindle Fire vs. Kindle Fire for Kids. While there really aren’t that many differences, the ones that are there are important to know about. Starting from the top, let’s take a look at these differences a little bit more in depth. The very first thing that I’m sure you’re going to notice being different between the Kindle Fire and the Kindle Fire Kids Edition is the fact that the Kindle Fire Kids Edition is priced a little bit higher. Normally, the price difference is right around $20, which honestly isn’t that big of a jump, but why is there a price difference at all? There’s a little bit of a price difference because of all the additional features that the Kindle Fire Kids Edition has that a normal Kindle Fire does not. The additional features included with the Kindle Fire Kids Edition are things like the 2-year worry free warranty, availability of Amazon Freetime Unlimited for one year, more age-appropriate material, and a protective case. When looking at these two tablets, perhaps the most value packed feature that is included with the Kindle Fire Kids Edition is the exceptional 2-year worry free warranty. Tablets for kids are supposed to be designed to be played with, right? Well, sadly, many times the tablets that are made for kids to play with, but their warranties are pretty lackluster to say the least. With the Kindle Fire Kids Edition, this is the furthest thing from the truth. The Kindle Fire Kids Edition comes with a worry free 2-year warranty that covers drops, spills, screen breaks, and so much more. Basically, if the tablet stops working correctly for any reason whatsoever, then you can rest assured knowing that you will receive a replacement for free as many times as needed for two full years. This is a very impressive warranty in my opinion, and the peace of mind that it gives you knowing that regardless of what your child does the tablet, or other children and adults do who use the tablet, Amazon has your back, is well worth the additional price of $20. As I recently discussed in this post, the warranty works very well, and I recently had to take advantage of it myself. While there are apps out there that will allow you to make any Kindle Fire very child friendly, the included features with Amazon Freetime make setting your child’s tablet with proper parental controls a breeze. By just selecting a couple of options such as your child’s age, what you want them to be able to access, and if you want them to have Internet access, you can have quality parental controls installed on your child’s profile in just a few minutes. Personally, I love the fact that with one quick change, I don’t have to worry about what my children are doing while using their tablet. It blocks features that many apps encourage such as social media sharing, watching videos that are not age-appropriate, or visiting websites that they shouldn’t be on. Of the many tablets I have reviewed, the Kindle Fire Kids Edition has one of the simplest parental control walk-throughs available, and it works very well for such quick implementation. 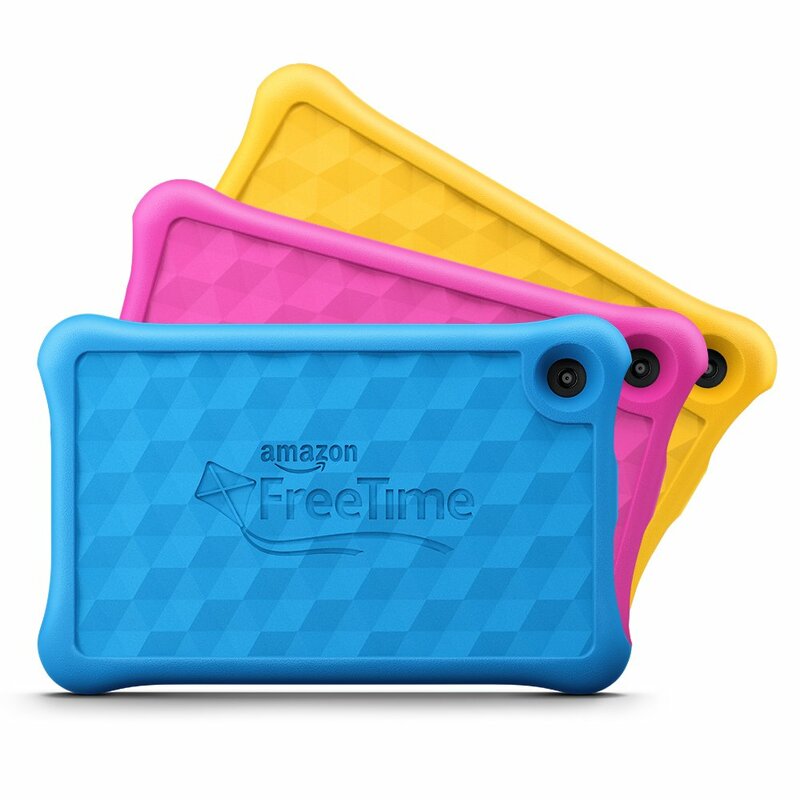 Now, with the traditional Kindle Fire, you can still install Freetime, but kids don’t get access to videos, books, etc.. like they do with Freetime Unlimited. 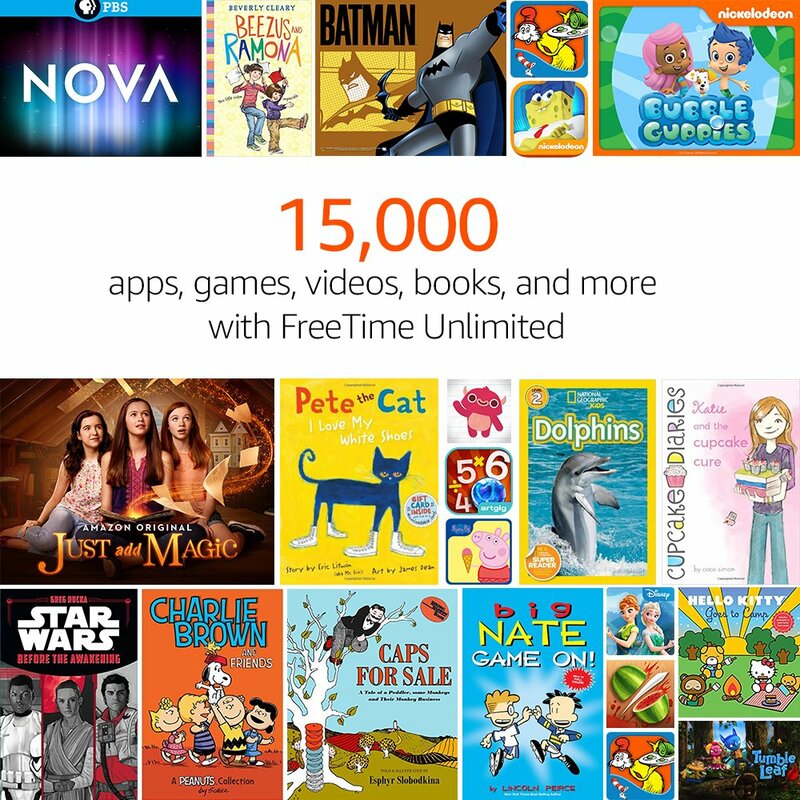 Amazon Freetime Unlimited is a great collection of age-appropriate movies, videos, apps, games, books, and much more. At the time of this writing, Amazon states that there are over 15,000 titles available. Best of all, it’s tailored to children of different age groups, and there’s even a setting for preteens and young teenagers. The Kindle Fire Kids Edition includes a membership for the four child family plan for one year. 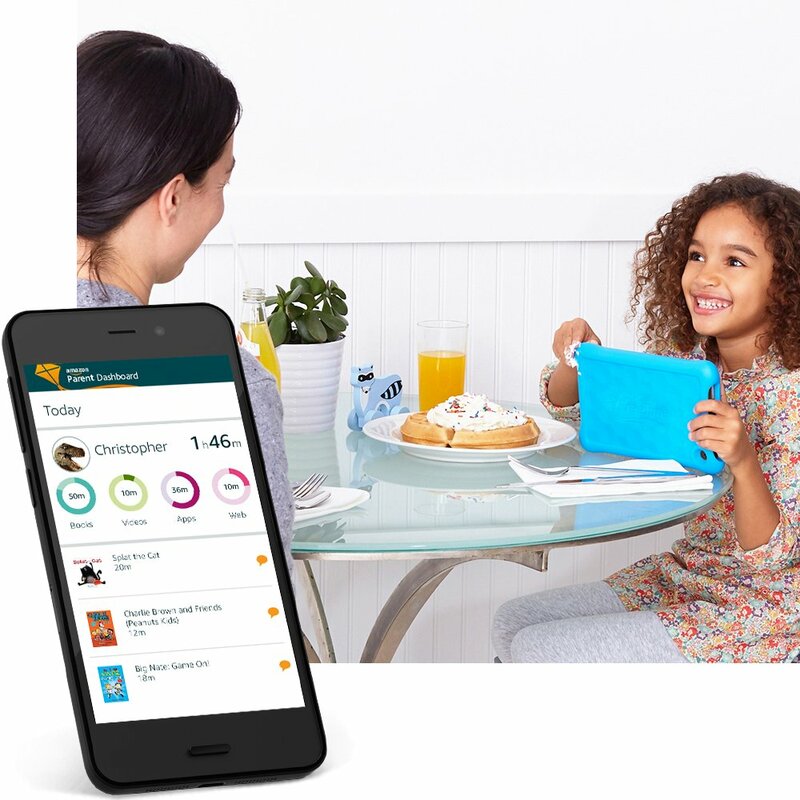 Purchased separately, the family plan of Amazon Freetime Unlimited is currently priced at right around $129. This includes access for up to four children for one year. For families that have only one child needing access and prime membership, Amazon Freetime Unlimited is available for right around $3 per month for Amazon Prime members. With all the features that it offers, having access to it for free for one year is an impressive value. It is also important to note that if you do not wish to continue the subscription available for Freetime Unlimited, you do still get to have all the parental controls and security settings available inside of Amazon Freetime. Freetime Unlimited is an additional service available inside of Amazon Freetime. If you’d like to know more about exactly what Amazon Freetime is, please take an opportunity to review our post on what Amazon Freetime is all about. Last but not least is the fact that the Amazon Kindle Fire Kids Edition comes included with a soft rubber protective case. While it certainly isn’t as powerful as some of the different cases out there like the OtterBox line, it still going to add a little bit of protection when it comes to keeping your child’s tablet safe. Currently, you can choose from three different colors of protective cases including blue, pink, and yellow. While this case isn’t going to keep your tablet completely secure, it does help with accidental damage from normal playtime. As you can see from all the options available above, you do get quite a bit of value for the additional $20 that it will set you back to purchase the Kindle Fire Kids Edition instead of a typical Kindle Fire. Personally, I feel that the value added by the one-year subscription of Amazon Freetime Unlimited and the peace of mind that is given by having a two year worry free warranty is very well worth the investment.